I recently came across Round the Red Lamp, a delightful volume of medical-themed short stories and other medical writings of Sir Arthur Conan Doyle, a medical doctor and the creator of Sherlock Holmes. Among its many treasures are two of his letters that were printed in newspapers in 1887 on the subject of compulsory vaccination. A Compulsory Vaccination Act was in effect. At the time, the only vaccine available was for smallpox, but the anti-vaxxers were already out in full force. It is fascinating to see how little has changed after 131 years. Today’s anti-vaccine arguments echo the same words that were used in 1887. Is it immoral for a Government to adopt a method of procedure which experience has proved and science has testified to conduce to the health and increased longevity of the population? Is it immoral to inflict a passing inconvenience upon a child in order to preserve it from a deadly disease? Does the end never justify the means? Would it be immoral to give Colonel Wintle a push in order to save him from being run over by a locomotive? If all these are really immoral, I trust and pray that we may never attain morality. He points out that the ravages of smallpox had been forgotten since vaccination made the disease a rarity. In earlier generations, advertisements for missing relatives regularly described them as pock marked. Mary, the wife of William the Third, died of smallpox. Whole tracts of country were decimated. But by 1887 many doctors never saw a single case in a lifetime of practice. Similarly, today the public has forgotten the devastation once caused by vaccine-preventable diseases such as measles, mumps, whooping cough, diphtheria, tetanus, and others. The threat doesn’t seem real to them. 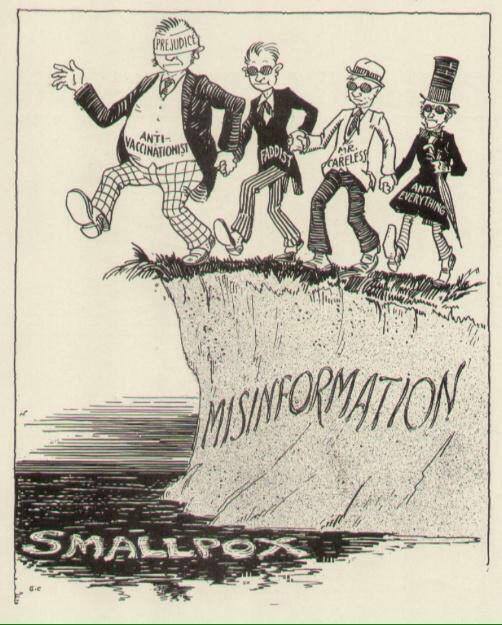 Just as today’s anti-vaxxers claim that it was hygiene, sewers, and safe water, not vaccines, that made the diseases disappear, the Anti-Vaccinationists of his day tried to account for the decreased incidence of smallpox with other explanations. They speculated that the disease might have changed, but there is no reason to think so. In the twenty-first century, I have heard people claim that smallpox is still around but is being misdiagnosed as chickenpox; that’s absurd, because we can clearly tell the two apart by clinical appearance and lab studies. Conan Doyle points out that nurses and doctors had worked in smallpox hospitals for over fifty years without a single case of them catching the disease, because they were vaccinated. He says, “As to the serious effects of vaccination which Colonel Wintle describes as indescribable, they are to a very large extent imaginary … Some parents have an amusing habit of ascribing anything which happens to their children, from the whooping-cough to a broken leg, to the effects of their vaccination.” We are still seeing this today, with alarmist false claims of all sorts of harm from the HPV and other vaccines, and from the ongoing concern that vaccines cause autism despite all evidence to the contrary. Conan Doyle says, “Colonel Wintle’s second letter appears to me to contain a jumble of statistics and quotations, some of which do not affect the question at all, while others tell dead against the cause which he is championing.” That also describes much of the supporting evidence today’s anti-vaxxers bring to the table. Wintle argues that vaccines are poisons. Conan Doyle points out that the most useful drugs, such as opium and digitalis, are poisons. We accept a small risk to get a great benefit. Today any event can be reported to the Vaccine Adverse Event Reporting System (VAERS) and the anti-vaxxers are ready to falsely claim all of them as proven vaccine damage. The more things change, the more they’re the same. Vaccines have always encountered opposition, and the arguments continue to be the same. It’s sad when one of the greatest accomplishments of science is rejected because of misinformation and faulty arguments. Conan Doyle’s thinking about vaccination was sound, and he was fighting the same battle we’re fighting today. Unfortunately, his thinking on other subjects was not always so sound. He believed in spiritualism, parapsychology, telepathy, psychic abilities, and séances … . But that’s another story for another day.